IHPME alumni Wendy Nelson and Valerie Rackow are recipients of the 2018 University of Toronto Arbor Award, recognizing their volunteer efforts and the lasting impact they have had on students, fellow alumni and faculty within the IHPME community. U of T President, Meric Gertler, presented the awards on Monday night at The Carlu in downtown Toronto. Since 1989 the U of T Arbor Awards have acknowledged the contributions of alumni who exemplify the University’s values and mission to “meet global challenges, and prepare global citizens.” Nelson, the co-lead and founder of Vernissage Health has remained involved with the IHPME community since her graduation in 1983, and Rackow (graduate, 1984), an adjunct faculty member with the Institute, has co-taught an undergraduate course in health policy that encourages younger students to consider a career in public health and health systems research. “It has always been hugely important to me to be an alumnus of IHPME,” said Nelson. At the age of 21 Nelson moved from the United States to pursue her Master’s degree at the University of Toronto. She immediately felt supported by faculty and alumni from what was then known as the Department of Health Administration and after graduation; she decided to continue her career here in Canada. 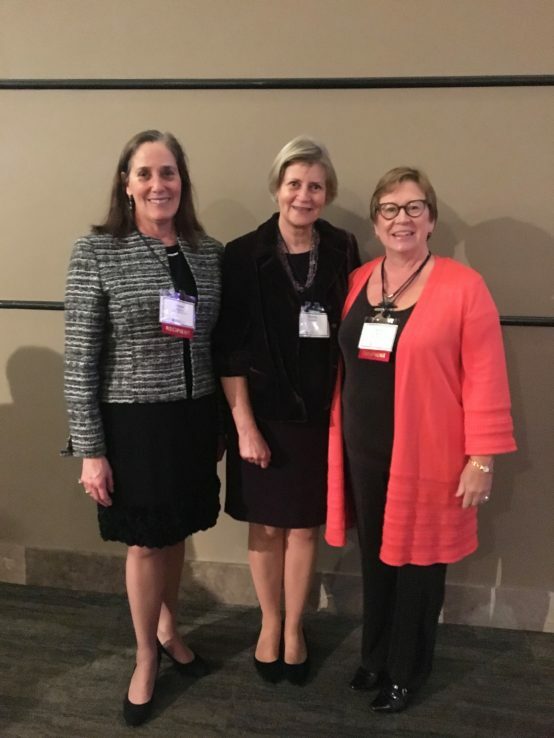 While Nelson remained involved in the department and Alumni Association for many years, as President, and as a lecturer and preceptor, she knew she wanted to give of her time to mentor new leaders emerging into the health system. Vernissage Health is a leadership development initiative which consists of a series of dialogue sessions between experienced leaders in the health system, often IHPME alumni, and graduate students in advanced years of study. Co-facilitated by dialogue hosts, an intimate group environment is created to establish trust and build relationships between participants, with the sessions also designed to provide opportunities for listening and self-reflection using personal stories, guided conversation and journaling. “I know what it feels like to be young, inexperienced and moving into a significant leadership role in health care. During that transition in my life, I was filled with gratitude that so many U of T alumni helped support and mentor me along my journey. I wanted to provide similar support for our new generation of leaders in health care,” said Nelson. Vernissage Health has expanded to include graduate students from across the Dalla Lana School of Public Health. In 2019, a series will include both IHPME students and those in the MBA Health Services Stream at Rotman School of Management. For Arbor award recipient Valerie Rackow, volunteering and giving back to her community has been a life- long commitment. She has held several volunteer leadership positions in the community, including President of the North Toronto Skating Club, Secretary and Executive Board Member of the Bernard Betel Centre for Creative Living for Seniors, and Co-Chair of the Avenue Road Eglinton Community Association. When she is not giving back to the wider community, Rackow has remained very involved in supporting IHPME students as both instructor and mentor. “I always joke that I got to U of T and never left,” said Rackow. From serving on the executive of the IHPME Alumni Association for many years, organizing reunion dinners and large meetings in collaboration with the Ontario Hospital Association, to lecturing in the School of Community Health, Rackow has been busy. Three years ago, she began working with IHPME faculty member Raisa Deber on developing a course in health policy for undergraduate students as a means of expanding the Institute’s educational reach. Structured around the OISE model, the course as a fourth year elective, has evolved from a class of eight students in its first year to upwards of 25 or more. Exposed to health policy research early on, some continue into graduate school in the Dalla Lana School of Public Health, Faculty of Medicine, or public administration. “I love teaching them, they are bright, fun and inquisitive, it makes you feel good about the future,” said Rackow. Both Nelson and Rackow have found a sense of happiness through their volunteering efforts as they teach and mentor the next generation of IHPME students. “The rewards are huge, in terms of friendship and the knowledge that you are helping to prepare students for their careers in the world,” said Nelson.